Wild Wadi is a water theme park covering 12 acres of coastline and comprising 24 adrenaline-pumping, state-of-the-art rides and slides. It is just a 20 minute drive from the centre of Dubai. Situated conveniently next to the Burj Al Arab Hotel and the Jumeirah Beach Hotel on the Jumeirah Beach road, this water park was designed to be like an Arabian wadi (riverbed) with characters influenced by Arabian folklore. It has a variety of rides and attractions to suit children and adults of all ages making it a top “must-do” tourist attraction. Master Blasters shoot riders up to the top of a labyrinth of gravity slides on rubber rings to save you walking up hundreds of steps. Thrill-seekers can try the Jumeirah Sceirah, the tallest and fastest free-fall waterslide outside North America, rising to 33m and reach speeds of to 80kmph! 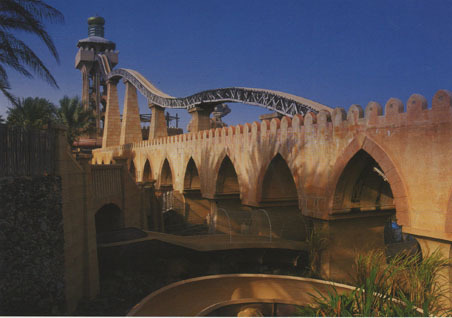 Other exciting rides for the whole family to enjoy include Flow Riders, Juha’s Journey, Breaker’s Bay, Juha’s Dhow and Lagoon, Wadi Wash, and Flood River Flyer. A total of 90 lifeguards are permanently on duty to keep you safe while you are having fun.